Is It Time for This Widower to Give Love One More Chance? After the devastating loss of his second wife, Seth Hostetler believes a lasting love is beyond all hope. A year has passed, and his mamm and sister are determined to see him happily married once again. But how can he open his heart to another woman when their relationship could end in tragedy? On an outing with his family, Seth comes across an Amish potter hard at work and decides to try his hand at the trade. He quickly takes to this creative outlet, pouring his long-buried emotions into each utensil he shapes. Unfortunately, the fancy nature of his art draws the disapproval of his district's leadership. His work also puts him in the path of Leah, an Englisch woman employed by the Amish to sell their wares to tourists. Despite her aloofness, there's something about her that speaks to his wounded soul. But what is Seth to do when the things he wants most threaten to pull him away from the life he's committed himself to live? A compelling novel of second chances and the power of God to redeem hearts and dreams, set in the inviting Amish community of Lancaster County. 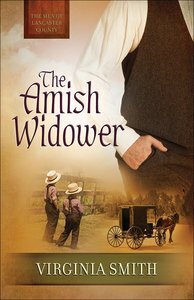 About "The Amish Widower (#04 in The Men Of Lancaster County Series)"
Virginia Smith is the author of more than a dozen Christian novels. Her books have been named finalists in the Daphne du Maurier Award of Excellence in Mystery/Suspense, the American Christian Fiction Writer's Book of the Year Award, and ACFW's Carol Award. When she isn't writing or speaking, Ginny and her husband, Ted, enjoy exploring the extremes of nature. They live in Salt Lake City, UT. Apprentice blacksmith Jake Miller is keen to court lighthearted Amanda Shetler. But when required to help his boss's emotionally wounded niece Priscilla reconnect with the community, Jake is slowly drawn on a different path - one that will challenge everything he knows about forgiveness.